Waves are a popular hairstyle among African-American men and can be seen on the heads of a number of celebrities. If you try to duplicate the "deep wave look" but can achieve only micro waves, it is probably because the natural curl pattern of your hair is too small in diameter. While that cannot be altered permanently and the hair that grows in will have micro waves, you can process your hair chemically or heat style it to get deep 360 waves. Cut your hair to a length of about 1 1/2 inches to ensure it is long enough for waves but not too long. Shampoo and condition your hair as normal. Protect your hair from heat damage by applying a deep conditioner to your hair and leaving it on for about 20 minutes. The extra moisture will serve as a barrier from heat damage. Spray or rub on a heat protectant as well to provide further protection against damage to your hair. Set a hot comb on medium if it simply has a control switch, or turn its temperature knob no higher than 400 F. Work the hot comb in small sections from the back of your head toward the front to straighten your hair. Move slowly, but do not stop moving the comb, and perform no more than two passes of the comb per section. Distribute a quarter-sized amount of a non-watery moisturizer or pomade throughout your hair. 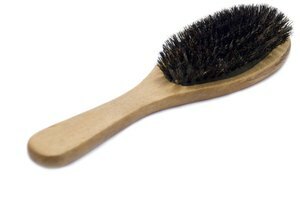 Brush it through so it covers your hair evenly. Then take the brush back through your hair from the crown outward to begin the waving process on your hair. Brush hard, and follow your hair's growth pattern. Find wave patterns to determine how often you should brush your hair to encourage deep 360 wave formation. Some wave patterns are online. Wear a stocking cap whenever possible to keep your hair protected and your waves moisturized. Ask an experienced friend or relative to apply a mild relaxer or texturizer to your hair if you have no experience doing it yourself. Leave the relaxer on for no more than five to seven minutes to avoid straightening your hair completely. Rinse the relaxer or texturizer thoroughly from your hair. Replenish the moisture via a deep conditioner. Dry your hair using a blow dryer, or let it air dry. Letting it air dry will give you a better idea of your hair's wave. 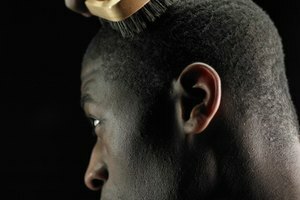 Apply a non-watery moisturizer or pomade to your hair, using a brush to distribute the product evenly. Brush your hair flat against your head, following the natural growth pattern and moving the brush from the crown of your head outward. Find a schedule that dictates how often you should brush your hair for a particular look; such schedules are online. 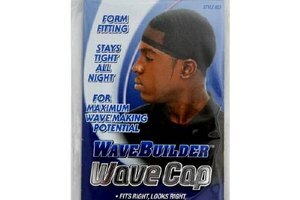 Wear a stocking cap whenever possible to encourage wave formation. Visit a licensed cosmetologist if you know of no one who can safely and expertly apply the relaxer.